My name is Daryl and I am known as Funken_A on forums and online video games. If you see the name it’s most likely me. I love music. I am a keyboard hobbyist and big fan of improvisational music, The Grateful Dead, Phish, Railroad Earth, and old timey rock and roll like Led Zeppelin, AC/DC, Pink Floyd. Big fan of Bluegrass, motown, blues, folk and I love my Funk. I started getting into aquarium in my college years. My roommate had a tank and it really sparked my interest, a simple tank with some snakeheads that we fed goldfish to. As college kids that was so cool. So I grow up get married go through those party years, got a good job and a friend of my wife has this aquarium and asked if I would want it. That was 1998/99> The internet was becoming a thing and in my search for aquarium idea etc. I came across Takashi Amato photos which was all I needed to see. That led me to the Krib. The Krib was the 1st online website that had all kinds of detailed info about planted aquariums, with all kinds of dedicated hobbyist debating and sharing info. AND … Liquid Carbon dosing to ensure no gaps in CO2 . I went through 3 different lights. Each one more powerful then the last one as my project grew and grew. What was once just going to be a low tech DIY CO2 quickly became high-tech full CO2 injection. There was no turning back. My DIY CO2 had issues. No stability and hair algae was the result. I gave up on DIY because this was obviously going to be the issue with higher light. Got my CO2 up and running with a ceramic diffuser but the hair algae was not going away and numerous PH test kept telling me my CO2 was not optimal. This is when I built my own cerges CO2 reactor. 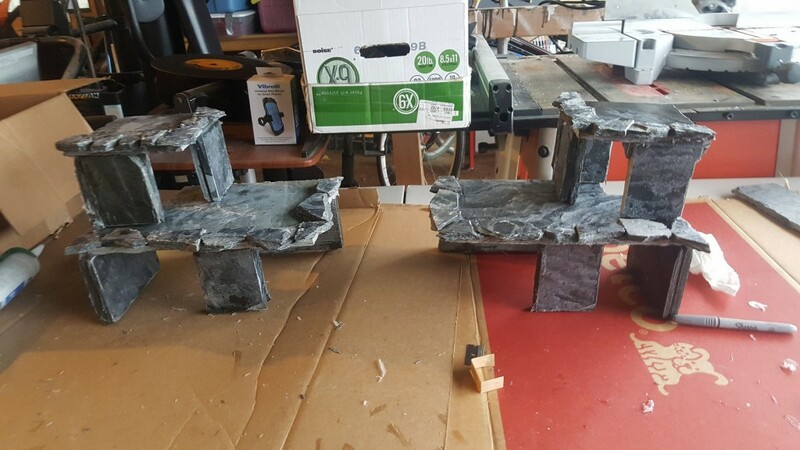 I have a thread in the DIY forum showing how I built mine, very detailed for the curious. This was great but I still had some issues. I also run a HOB filter that had biowheels on them. 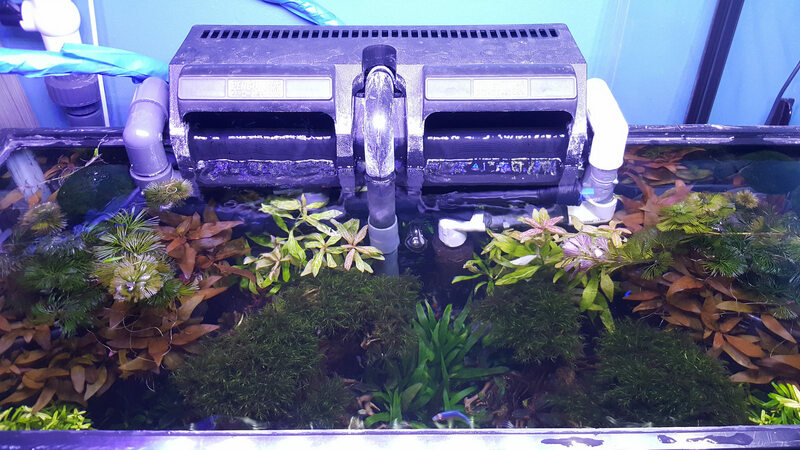 Biowheel filters with active carbon are a big NO NO for high tech planted aquarium. Biowheels degas CO2, and active carbon tried to remove trace minerals that plants need. I was able to fix this by tossing the wheels and replacing the filtration medium with some nylon bags stuffed with perlite, and filter floss. I also use some bioballs in there. I was using way too little fertilizer early on trying to be too careful. BUT research says with EI fertilizations you aren’t worried about too much nutrients because you commit to the weekly water changes. Hair algae is gone. Phew. Today I am battling BBA. 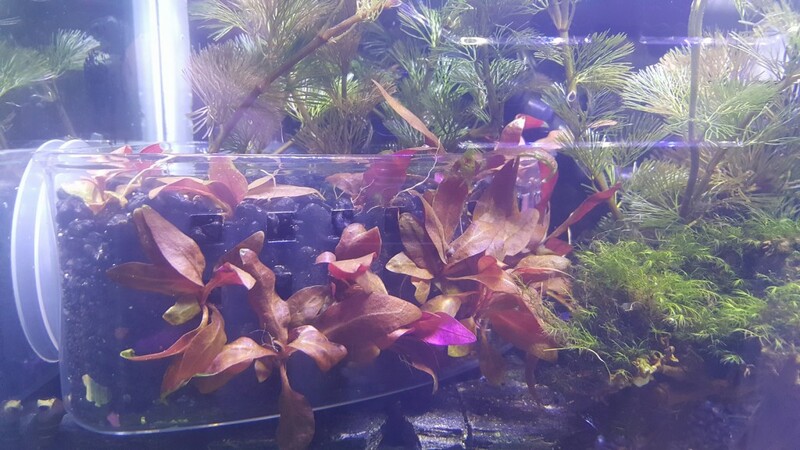 This is a direct result of me reducing my ferts again experimenting with trying to bring out the reds and the pinks in my Cabomba Furcata and my Hygrophila Polysperma by limiting nitrogen. This has not been successful so a big prune and increase ferts. Now to wrap up the rest of my structure, I am using corner shower caddies on the top left and right corners. Placed some fine mesh stainless steel surgical screen on the bottom to cover the holes. I chose soap caddies on the mid level behind the bonsai. The substrate for all these caddies is eco-complete, aquarium gravel, root tabs and laterite clay. On the top corner caddies I used the holes in the front to house Alternanthera reineckii ‘Mini’. On the top of the caddies are cabomba furcata and more Alternanthera reineckii ‘Mini’. The soap caddies behind the bonsai house Hygrophila Polysperma. On the front of the soap caddies I zip tied cholla wood and stuffed the wood with Christmas moss. Good times and the bad: I was able to do my 1st planted tank. 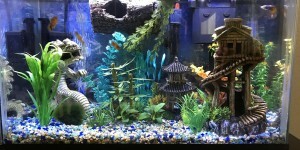 A used 55 gallon acrylic with a T12 florescent set up. Low tech yeast/Co2 but it was a good tank while it lasted. Had its issues but I was hooked. That tank had to be moved a year later as we bought our house. I tried to move it drained but the last turn was too much picked it up just a little too much and everything slid to one side. Oh well, I’ll start another one and did it right this time. I got laid off 6 months later, went back to school got called back 4 years later and priorities changed. Now my tank is a simple 30 gallon. I have been using this tank for close to 15 years. It was a cichlid tank for a while, but they got ich because I got lazy. Not proud, lesson learned, unfortunately they didn’t make it. I had a 20 gallon at the time as well and eventually moved those fish into this 30 gallon. Plastic decoration no plants. This went on for 7 or 8 years then I needed to bleach my decorations cause they were looking a little ugly. I did this once or twice a year. Well this time I must have not rinsed well enough.. Killed the tank I was devastated. I had a feather fin catfish in there that was 14 years old. I beat myself up for that one often. I got the tank back up and running. Nothing cures sadness or guilt like a new puppy right. Got me a new feather fin catfish, got a couple clown plecos. Started looking searching around the internet for some new and interesting snails to have for an algae crew. That’s when I discovered nerite snails and rabbit snails. Rabbit snails are what really rekindled my love for aquariums. So I got 8 yellow rabbit snails 5 olive green nerites and 5 black racer nerites. Still got the plastic decorations, but decided to buy some Marimo balls and a few anubias on driftwood pieces. The moment I put the rabbit snails in the tank they struggled to find footing on the gravel floor. I decided I need more flat space for my rabbit snails. That’s when I built my structures. I wanted to create more natural caves for my catfish instead of plastic décor, but I really wanted flatter spaces for the rabbit snails to thrive some. This structure you see is nothing more than 100% slate tile. I use GE silicone 1 to build it and had a miter saw and tile blades to cut it . There is access in the back to the middle levels and large areas under it all where my catfish hangs out. But now with all this flat space, and a wide gap in front I sure could use some more plants. Well that means I need to replace the substrate, so I inserted the structures and replaced my substrate while all the fish were in the tank. The bottom level substrate contains aquarium gravel topped with sand with laterite clay balls I made covered by more sand and more aquarium gravel. Plants: Now I am searching for plants and what was supposed to be low light, low tech was becoming high light high tech. I kept seeing cool things I had to do. I had these flat spaces designed into my structures and I had seen these moss bonsai trees in photos. 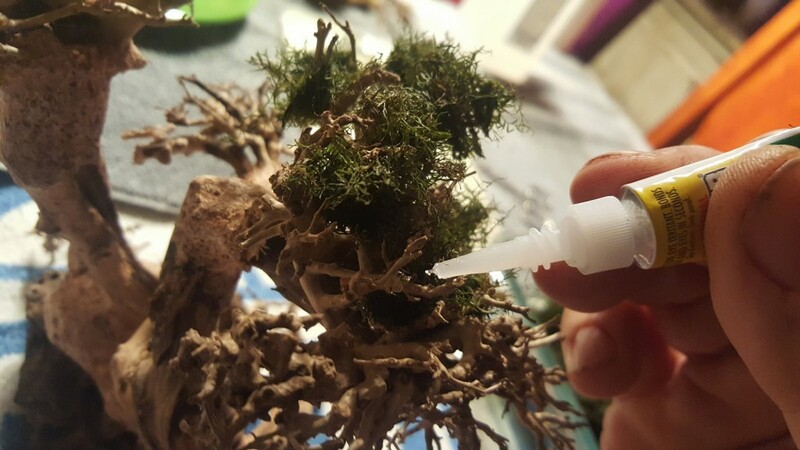 I had to do this so I was able to buy the driftwood pre-made and I simply used crazy glue to attach fissidens fontanus to form the tree. However I really wanted some plants around the base so I added some Red Cloud Bucephalandra around the bases of these bonsai, all attached with crazy glue. Surrounding the bonsai are Anubias nana on driftwood, as well as wavy leaf bucephelandra on driftwood. There are also cholla logs stuffed with marimo moss laying about in there. On the ground level up front we have Rotala Indica on the sides. There are 4 patches of pygmy chain swords and 3 patches of Alternanthera reineckii ‘Mini’. In the back middle is Crytocoryne Petchii. My occupants today are rabbit snails, olive nerite and black racer nerite snails, Malaysian trumpet snails, unwanted pond snails which I use a turkey baster and nab every one I can. Kind of fun if you got a pond snail issue. I had Freshwater shrimps and I had babies but the babies have disappeared and I think my shrimp have been consumed, by my featherfin . For fish I have a featherfin catfish, a clown pleco, and just received my new runt a L134 Leopard pleco. I have 8 Glofish Tetras that really look great in the tank and they are fun active fish. Maintenance: As for testing my parameters. At first, all the time; multiple times a day but as I get my finger on the pulse of my tank I test much less. I am getting better at visual cues like algae to know when I need to check something. My advice to all planted tank owners, it has to be a labor of love. I do weekly water changes every Sunday and I have yet to be able to do my tank maintenance in less than 2.5 hours. 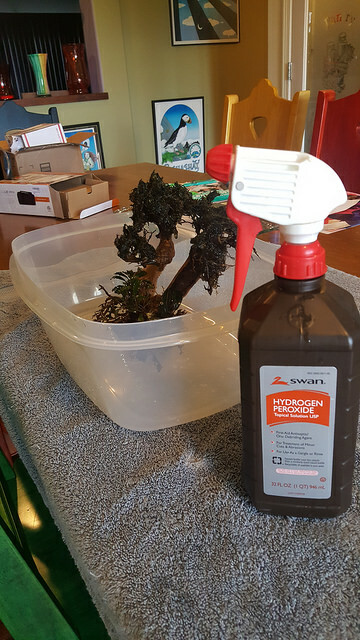 I do all my pruning replanting filtration maintenances and anything else that needs to be done gets done during water change day. These chores are rotational but I have to put in the time to maintain this tank. I’m still learning. 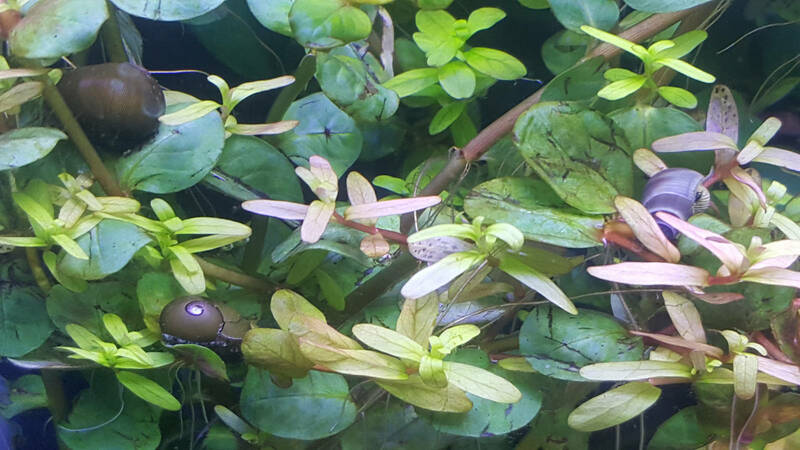 Algae issues.. H2O2 is a helpful friend. 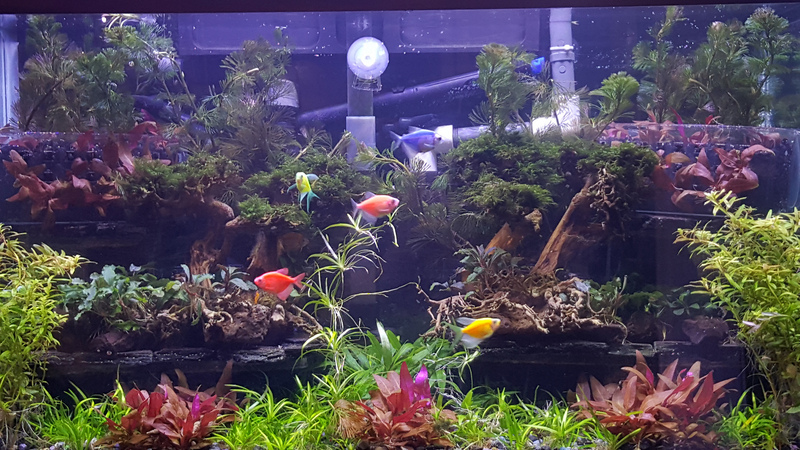 Pruning helps, water flow is essential but most of all the proper balance of CO2, Light and fertilizers must be achieved and every single tank is different. Algae are your visual cues to what your issue might be. Low CO2 hair algae, low fertilizers BBA unkept tank will lead to all sorts of algae issues. Conclusion: Fast forward 17 years and here I am TOTM May 2017 Winner. Proud to be a part of the website/forums, and thanks to all the voters for myself and the other very nice tanks, I had to compete against. We need more of you to participate!! Hopefully I did not ramble too much and provided good information and inspiration. Tank on and thank you. Filed under Articles, Featured, Freshwater, General Articles, TOTM.